Tempted to buy a colored portable canopy for shows? Think carefully before you spend the money. Here's why you'll almost certainly be better off with a white tent. Your craft show canopy really should be white. The vast majority of professional craft artists who sell at outdoor shows use a white canopy. This choice is not a coincidence. A white tent will serve most craft artists better than a colored canopy. A white tent will show your products to their best advantage, and it will remain cool on hot days and look professional at any show. Some juried art shows or farmers' markets require you to use a white canopy. Not all shows require you to use a specific color, but some will. Specifically, some of the better shows require craft artists to use a white tent. If you purchase a colored canopy instead of a white one, you will either have to avoid participating in those shows, or you will have to rent or borrow a white canopy (or buy a second canopy) specifically for use at shows that require white craft tents. Perhaps the shows you are currently planning to attend don't require a white tent, but there may be some better shows that you'll want to do in the future, and there's a reasonable chance those shows will require you to use a white tent. It's wise to think ahead, and ensure your tent is compliant for any shows you might want to do in the foreseeable future. A white canopy will show your items in their best and truest light. A colored canopy will reflect the color of the canopy onto your items, and the color of your products will not be true. Customers may either bypass your items because they have not seen them in their best possible light, or they will have to take your items out of the tent to see the true color, which is very inconvenient, especially if you are busy with several customers. A white canopy will not reflect an odd color into your tent, so your pieces will appear exactly as you intended and in their best possible light, so they can make the best impression on customers. A colored canopy can make your booth dark. Good lighting is a crucial element of an effctive craft booth. You might not always be able to include lights in your display at an outdoor show because you may not have access to electricity, although battery operated lights are reducing the need for an outside power source to light up your booth. However, even without actual lights, you still need to consider the effect of lighting in your booth. If you're not careful, a dark colored craft show canopy can make the interior of your booth darker than it needs to be, and a dark booth can be less inviting to customers. A white canopy will help ensure your booth is as bright and inviting as possible. Dark colored canopies can be noticeably hotter than white canopies. Your canopy is supposed to shelter you from the sun and keep you cool at hot, outdoor shows. A cool, white canvas canopy will help keep you comfortable and at your best and able to focus your energies on your customers. Occasionally people are tempted to pick up a blue or green canopy because they have found a fantastic sale, and, understandably, they want to save some money. 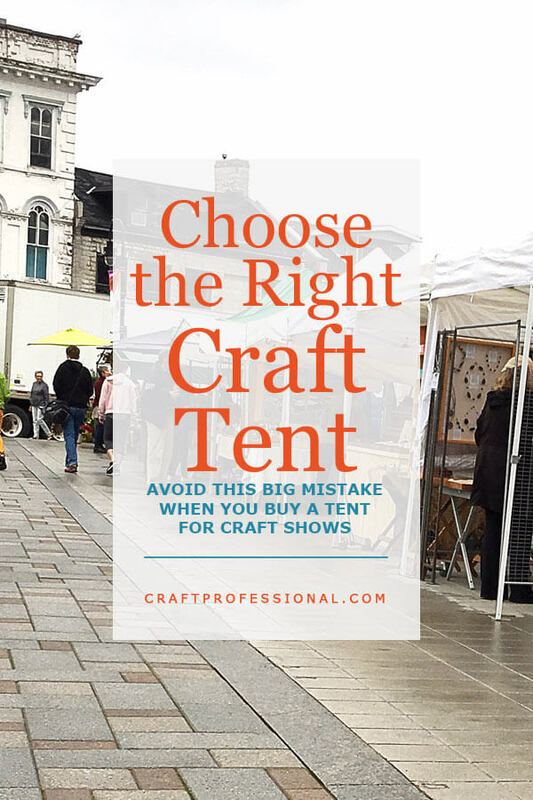 In my opinion, saving a little money on a cheaper craft tent is a false economy in that you can end up losing money in the end by missing out on sales opportunities. You may be excluded from good shows that require a white tent or lose sales because your items don't look their best under a dark canopy. In the end, you may find you need to buy or rent a second, white canopy because your colored canopy doesn't meet your needs, and that will cost you more than the money you save on a colored tent. 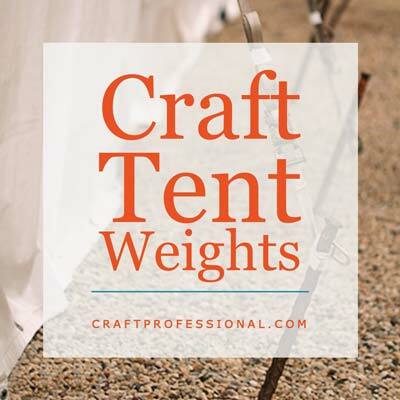 You don't have to break the bank, but if you know you are going to attend several outdoor craft shows, a little extra money invested up front on a better, white tent is money well spent. Occasionally people believe that a colored canopy will help them stand out from a crowd of white craft tents. It is true that if you had a blue canopy amid a sea of white canopies, people who were looking to find your booth a second time after visiting once before may know to look for the blue canopy. 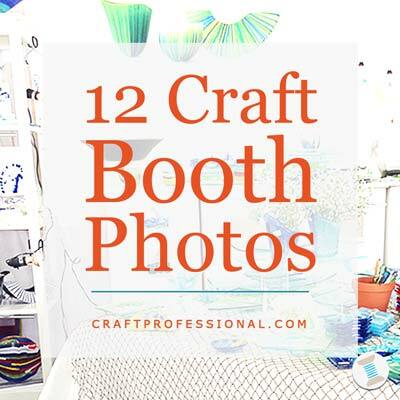 While I have very occasionally seen a colored canopy used well at a craft show, most of the time a colored tent detracts heavily from your items and will not make your craft booth stand out in a positive way. There are plenty of other ways to make your booth stand out that do not compromise the appearance of your items. 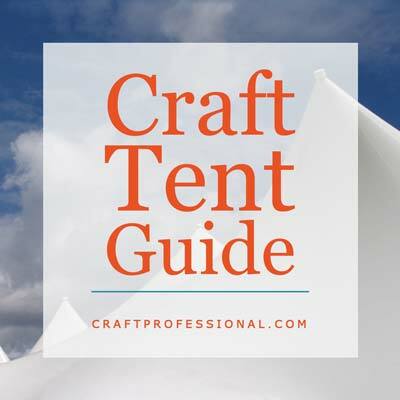 Comprehensinve guide to choosing a craft tent. Design your booth using portable tables. Secure your booth with tent weights.